UK hard rockers Heaven’s Basement are proud to reveal the cover art and track listing for their debut album ‘Filthy Empire’. The album has now been confirmed for a February 5th, 2013 North American street date via Red Bull Records. 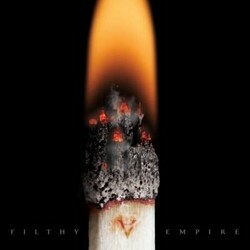 ‘Filthy Empire’ is produced by John Feldmann (The Used, Papa Roach, Black Veil Brides) and is the follow-up to the band’s independently-released, acclaimed EP, ‘Unbreakable’. The video for the first single from the forthcoming album, “Fire, Fire”, directed by Michael Maxxis (Ours, Sum 41, and Our Lady Peace), is streaming now on YouTube. For more information on Heaven’s Basement, make sure to check out heavensbasement.com and www.facebook.com/HeavensBasement.